An Under Deck Drainage System also called an Under Deck Ceiling, is like a dropped-ceiling underneath your second story deck. The ceiling actually collects the rainwater that would normally fall between the deck boards, and moves it into a rain gutter and away from your deck. It is similar to the construction that we all see at a gas station above the Gas Pumps. There is no sloped roof, but an engineered metal panel collection system attached to frame work. You can see a similar framework that already exists by looking at All Exteriors’ raised decks. The system simply collects the water and slopes it into a gutter. The gutter slopes to a downspout, the downspout drains the rain into a controlled location. Simply put, it’s a waterproof ceiling attached to the bottom of a deck. How Can An Under Deck Drainage System Benefit You? Under Deck Oasis can provide your home with a greater living space. You may have never thought of using the space below your deck, but the truth is you can! Under Deck Oasis can give your home more space by creating a roof under your deck, keeping you dry and in the shade for the lifetime of your home. Under Deck Oasis also hides and eliminates ugly mold and stains. 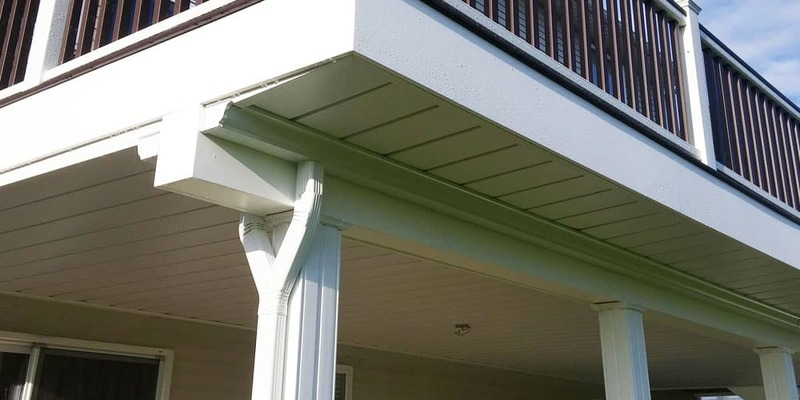 Contact All Exteriors today for more information about The Under Deck System! We are your the premier Under Deck Oasis Installers in the region!